The first thing I'll say is that the following reflections arise from an area of the mind unclouded by present presidential contentions. Upon the death of Nancy Reagan, I feel a deep gratitude for various things: personal dignity and grace; high standards; devotion to country and enduring ideals; and not least, warmth and humor. The Reagans were something -- both of them. I hazard the guess that many who read these words, even those who supported Jimmy Carter or Walter Mondale, remember with some appreciation a time when a political campaign wasn't a bid to send an opponent tumbling headlong to the ninth ring of hell. However apocryphal, the story of Ronald Reagan and Speaker of the House Tip O'Neill uncorking a bottle together after an all-day battle celebrates the possibility of there being such a bottle, of clinking glasses before moving on to the nation's next challenge. It's something nice to think about, the ideal itself presently seeming so distant and inaccessible. The Reagans, who were one spirit as well as one flesh, brought to the America of the '80s a feeling of hope concerning the "American dream," whatever that all-purpose catchphrase is supposed to connote. They excited criticism for policy stands and actions; they were dismissed for allegedly being both simple-minded and snobbish. They never exploded or lashed out, though Nancy's voice could grow icy at the tactless suggestion that her "Ronnie" was deficient in any significant presidential, far less human, attributes. They were a class act, the two of them. Together, they lifted America up during a hard time. They emerged from the midst of the tumult and shouting -- not without their share of failures and wounds. But they held their heads high, with smiles, despite everything, on their faces. They did their best; they did it with personal aplomb and profound sincerity. Profound, yes. 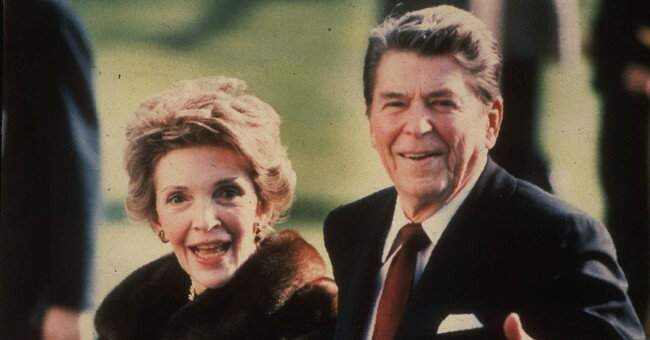 The Reagans were shallow only in the eyes of those who saw conservative ideas -- old-fashioned ideas, traditional ideas -- as shallow and unsuitable for the New Time in which we lived. Their unqualified love of America must have been to many outsiders their most unnatural and enraging characteristic. They seemed to wave the flag wherever they went, with thankful upward glances toward the Author of Liberty. Theologians they were not; they did not spend their time parsing doctrine and creeds. They had signed on for a different job: that of giving renewed life to the dream of a country where God's familiarity at national table and board made Him a welcome -- rather than alien -- presence. The Reagan years -- the years of the Reagans, to put it another way -- cannot be called paradisiacal. There were national divisions that persist today; there were wars and rumors of war. Clearly, if all our problems had been solved between 1981 and 1989, the contenders in the present campaign would be running for the right to bore us for the next four years. They would be planning picnics rather than raising outcries for change. All the same, the late Nancy and the late Ronnie dignified their callings and played their roles, if you want to put it that way. But what roles they were: champions of a country struggling to get back on its feet after some untimely knockdowns. If their labors worked only in part, still they worked. The end of the Cold War lay just ahead. Tax cuts did more than revive the economy; they reminded many that the fruits of work belong chiefly to the worker and only afterward to the government, which insists on its ever-larger share for public purposes. The Reagans moved about the world with a sense of their places as spokesman and spokeswoman for a country with an exceptional view of its duties and possibilities. They were never self-aggrandizing, never boastful, and always behaved in keeping with their view of the presidency as an office meant to exalt general (as opposed to navel-gazing) postulates and ambitions. I said at the start that these reflections arise not from examination of today's contentions. Nevertheless, to any who see these thoughts as relevant to today's presidential politics: All I can say, in a spirit of liberty, is take 'em however you'd like.